The Sangria is definitely getting out there! Symmone, our newest Caudo employee in Western Australia, has been very busy getting hotels and bottle shops on board the Sangria Wagon. Talking about Sangria wagon… It has arrived! The new wrapped Sangria van has crossed over into Western Australia where it will travel across the state to deliver Caudo Vineyards Sangria …the best Sangria you have ever tasted! One exciting new place this week is The Ravenswood Hotel, affectionately called “The Ravo” by the locals and is located on WA’s answer to the Murray River. It’s the kind of on-premise venue where you can rock up in your boat, park up whilst the kids swim in the river, swing from the famous tree with rope on it and chill out in the beer garden. They also have a Thirsty Camel drive through bottle shop. They always have live music there and Symonne told Daniel, the Bottle shop manager, that we are keen to get on board with Sangria to any events they have coming up. Hoodoo Gurus were there during our Australia Day weekend celebrations and they played to a sell out crowd. The Sandy Cove Tavern, is another popular location on the Murray River in Western Australia with a bottle shop attached. They loved it and want more. A funky little place with live music, very popular with both young and old crew. It’s very popular for Sunday Sessions. The Baldivis – Bottlemart Liquor Store are chomping through it. It’s very close to the Perth Wake Park and I’m sure a lot of the crew who work at Cables have gone there to grab their fix of Sangria. Steel Tree at the Foreshore is still pumping through their stocks. Hogs Breath Joondalup are loving it and the feedback has been very positive. Last but definitely not least, we come to ‘The Peninsula’. These guys are absolutely killing it and with their water location and the heatwave Perth had had for almost 2 weeks, it’s been very popular. For a few days Perth had nothing under 40 degrees! One night it was 37 degrees at 11pm! The next step is to look into the Mandurah’s Channel 7 Crab Festival and now with the new Sangria van in play we may be able to feature at the festival. How exciting! Wondering where you can purchase Sangria? The list is on our website. Just pop in your location and we will show you where your nearest stockists is. See our stockist list here! Caudo Vineyard is feeling a little Fringey! The gorgeous heritage listed British Hotel is holding fantastic Fringe shows throughout the next two months of Adelaide’s finest festival season! And guess what.. ..they are featuring all our wines, Sangrias and our newest range of sparkling wine iced teas aswell! Their shows range from hilarious comedy acts, stunning burlesque shows, bands, musical acts and the rocks festival which is everything all mixed into one! Their venue has an incredible history and function rooms to match! Great drinks with great entertainment is a perfect excuse to go see what’s been happening in Port Adelaide. This once sleepy end of town is now creating a brand new vibe with trendy shops, funky cafes, quirky laneways and brand new parks and river walks to explore! It’s a new buzz you do not want to miss! Adelaide’s Cellar Door Festival is on next Friday night and all day Saturday and Sunday at the Adelaide Convention Centre in the city. The one weekend of the year where some of the best South Australian wineries, breweries and food producers come together for the show of the year! The vibe is amazing and you can sample almost everything! Advice; you’re going to need to organise a taxi lift home. There’s over 180 producers from 15 South Australian regions, master classes hosted by renowned chefs and wine makers and plenty of dining experiences not to be missed. If you are going, please see our staff at site 10 in the Riverland section and say hi! Other great Riverland producers that will be showcasing include the amazing 919 Wines, Whistling Kite, Spook Hill, Bassham Wines, Salena Estate and Mallee Estate! See the website to purchase tickets and for more information. http://cellardoorfestival.com/. Tickets can also be purchased at the entry of event. A fine, sunny weekend to look forward to. Top temperatures reaching the mid thirties. A good opportunity to get out of the house and soak up some vitamin D …AND taste some wine? We think so. Monday is expected to bring the heat drawing temperatures up to 40 degrees. Possible showers are predicted for early next week – likely Tuesday. What’s happening in the Riverland? Loxton celebrates its 59th Mardi Gras. A family fun event where money raised goes towards community projects. Enjoy the 60-70 floats flow through the main streets and the crowning of the Ambassadors from 5. The Nippys Loxton gift follows. After the Mardi Gras, head to the Loxton Oval- the running race attracts professional athletes from the state and interstate. All the races are under handicap conditions making for exciting finishes. The clubrooms serve up some good food! Local wine, beer, coffee and food paired with local talent entertainment at the Renmark riverfront. Lock it in your diary. 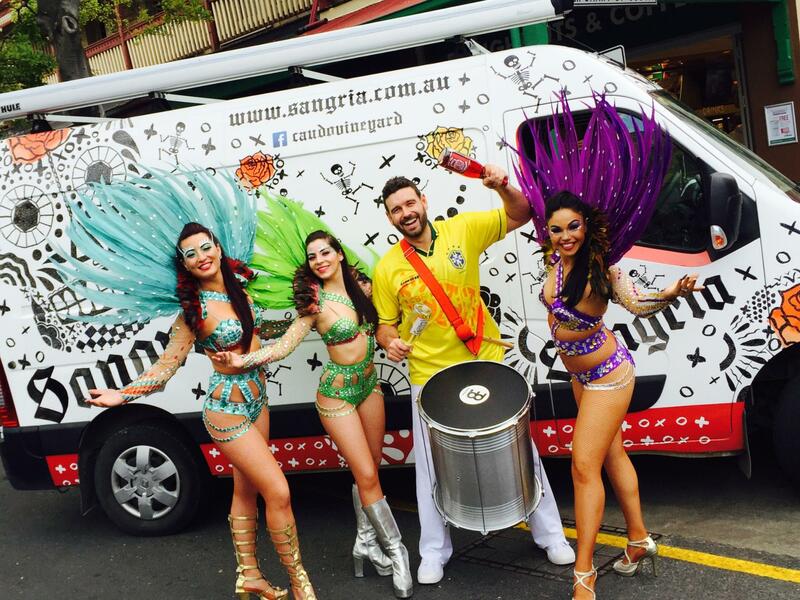 The ever so popular Sangria Van will be there! The main St of Barmera is full of food, jewellery, clothing, bric a brac and loads more. Grab a bargain and a good feed. Family friendly and lots to see and do. We hope you have an awesome weekend! Keep tagging your photos with #sangrialife #caudovineyard and #fueledbysangria to keep us in the loop with what you are up to.